Successfully Added Zero Kelvin - Japanese Style Blue LED Watch to your Shopping Cart. on 2011-02-15 05:33:31 Awesome watch! I was really impressed with the build quality, and the LED's are clear and bright, it was very is make it fit my wrist. It's very easy to use! I can only say, BUY IT! You will love it! I love this watch. Very different and intuitive to use. However it seems to puzzle most people I thought would have been interested in purchasing. Girls love it though. Fast shipping to Barbados. 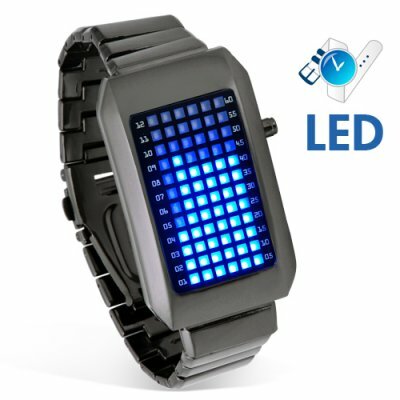 Will buy the entire LED watch collection for myself. I just received the watches 5 days ago, the build quality is very good compare with other version (interc**w). Thanks For Chinavasion for your profesional support!! Excellent watch, i love it, cheap, elegant and geek, thats 3 pros, came fast to mexico. the color is shiny dark, but for some reason looks grey here.